oooh I hope I win! I hope I win! Fingers crossed! Thanks for offering these great things!!! OOOOOOOOOOOOOO I love a mystery! Thanks for being so helpful !!! Would be awesome to win a giveaway! That’s great. I love coupons. How exciting, I love mysteries. 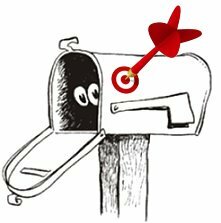 I hope this entry hits the Target™! I sure do love Thursdays on TT! I would love a mystery envelope – like Christmas all over again! Thanks for the chance!! Would love to win more coupons! I love a good mystery!! Hope I win. What a great idea. I would love some coupons! I would love some more coupons!! Mystery envelop, how exciting !!!! i was fortunate enough to win one of these once and would love to win again! amazing coupons! I feel lucky! Tonight’s my night to be a winner. These are such awesome giveaways. Please enter me in the contest. Thank you!!! Very Exciting! I hope to win. I would LOVE these coupons!!!! Thanks for the giveaways! What fun!